Unified cpu/gpu memory, like on consoles. 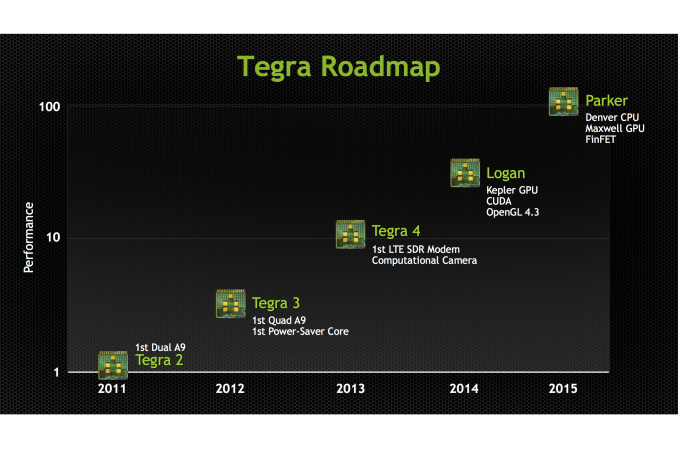 We're at NVIDIA's GTC 2013 event where team green just updated their official roadmap and shared some more details about their Tegra portfolio, specifically additional information about Logan and Parker, the codename for the SoCs beyond Tegra 4. First up is Logan, which will be NVIDIA's first SoC with CUDA inside, specifically courtesy a Kepler architecture GPU capable of CUDA 5.0 and OpenGL 4.3. There's no details on the CPU side of things, but we're told to expect Logan demos (and samples) inside 2013 and production inside devices early 2014. It’s interesting to note that with the move to a Kepler architecture GPU, Logan will be taking on a vastly increased graphics feature set relative to Tegra 4. With Kepler comes OpenGL 4.3 capabilities, meaning that NVIDIA is not just catching up to OpenGL ES 3.0, but shooting right past it. Tessellation, compute shaders, and geometry shaders among other things are all present in OpenGL 4.3, far exeeding the much more limited and specialized OpenGL ES 3.0 feature set. Given the promotion that NVIDIA is putting into this - they've been making it quite clear t everyone that Logan will be OpenGL 4.3 capable - this may mean that NVIDIA intends to use OpenGL 4.3 as a competitive advantage with Logan, attracting developers and users looking for a more feature-filled SoC than what current OpenGL ES 3.0 SoCs are slated to provide. On a final note about Logan, it’s interesting to note that Kepler has a fairly strict shader block granularity of 1 SMX, i.e. 192 CUDA cores. While NVIDIA can always redefine Kepler to mean what they say it means, if they do stick to that granularity then it should give us a very narrow range of possible GPU configurations for Logan. After Logan is Parker, which NVIDIA shared will contain the codename Denver CPU NVIDIA is working on, with 64 bit capabilities and codename Maxwell GPU. Parker will also be built using 3D FinFET transistors, likely from TSMC. Like Logan, it's clear that Parker will be benefitting from being based on a recent NVIDIA dGPU. While we don't know a great deal about Maxwell since it doesn't launch for roughly another year, NVIDIA has told us that Maxwell will support unified virtual memory. With Logan NVIDIA gains CUDA capabilities due to Kepler, but with Parker they are laying down the groundwork for full-on heterogeneous computing in a vein similar to what AMD and the ARM partners are doing with HSA. NVIDIA has so far not talked about heterogeneous computing in great detail since they only provide GPUs and limited functionality SoCs, but with Denver giving them an in-house CPU to pair with their in-house GPUs, products like Parker will be giving them new options to explore. And perhaps more meaningfully, the means to counter HSA-enabled ARM SoCs from rival firms. In addition NVIDIA showed off a new product named Kayla which is a small, mITX-like board running a Tegra 3 SoC and unnamed new low power Kepler family GPU.